At Four Lanes Community Junior School we believe that PE is important in the health and well-being of children. We also acknowledge that a broad, balanced, high quality curriculum and extra-curricular activities have a positive impact on concentration, attitude and achievement. 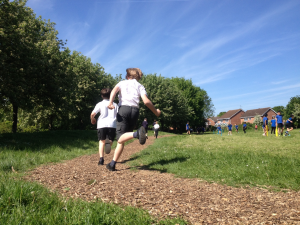 We are committed to ensuring that all pupils receive a minimum of two hours PE per week and aim to ensure they are physically active for at least thirty minutes of the day. This is usually delivered by the class teacher and other suitably qualified adults. We demand a high level of skill, qualification and professionalism of our coaches who provide both great quality PE lessons, extra-curricular opportunities and professional development for class teachers. We also train a number of children to become pupil Play Leaders. They organise and lead a range of games and activities in both the junior and infant schools thus encouraging younger members of our school community to be active whilst having fun. The Sport Premium funding is allowing us to develop a sustainable improvement in teaching and learning in PE by providing new resources whilst also providing further opportunities to increase pupils’ participation in sport. ◦Improvements in the quality and breadth of PE and sporting provision, including “increasing participation in PE and sport so that all pupils develop healthy lifestyles and reach the performances levels of which they are capable. This will be achieved through improving the quality of teaching and learning in PE, encouraging our pupils to adopt healthy lifestyles and taking part and competing in a wide range of sports activities and tournaments. Click below to see further details about how we spend our sports funding.